All polls and polling organizations are not created equal. 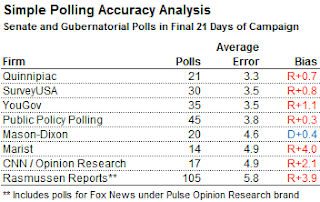 In fact, some pollsters appear to have a definite bias, usually in favor of Republicans. Here are the results of an analysis by Five Thirty Eight of the polling accuracy of eight major polling firms during the mid-term elections. The least biased were Quinnipiac and SurveyUSA. Rasmussen (including Fox news commissioned polls) was most biased. Lesson: Never accept the results from a single poll or polling organization as accurate, particular if the results vary significantly from those obtained by other polling organizations at about the same time. The poll results you are seeing may, and probably are, biased.